The Skinny: Zatoichi the blind swordsman is weary from his last violent encounter. Enchanted by memories of the smells and sounds of a favorite village, he returns there for a much-needed rest. There's only one problem: he has a very large price on his head, and a mysterious hired samurai, or yojimbo, intends to collect. Japanese screen legends Shintaro Katsu and Toshiro Mifune share the screen as Zatoichi Meets Yojimbo! Review: This installment in the immensely popular Zatoichi series benefits greatly from the swaggering, drunken belligerence of Toshiro Mifune, a veteran actor well-known in the west for his portrayal of a hired swordsman in Yojimbo (1961) and the humorous, violent Sanjuro (1962). The film relies on Mifune and leading man Shintaro Katsu to hold the audience's interest with their banter, while constructing an intricate plot involving corrupt officials, family betrayals, and of course, a cataclysmic final battle in the streets. In the opening sequence, Zatoichi dashes frantically through tall grass in a driving rain, pursued by unidentified assailants. He turns and cuts two of them down, then finds a hiding place and takes refuge from the others and the torrential downpour. Scowling, he laments the violence of his nomadic life, and his thoughts turn to a favorite village, one he hasn't seen in years. In the next scene, he is out of danger, approaching this paradise on a sunny day following the smell of flowers, and the trickling of a serene brook. He cannot see the body of a young man lying face-down in that same brook, the first ominous portent that all is not well in the small village. As he clicks his cane against the familiar burial markers along the roadside, he cannot see the rows upon rows of new graves. While Zatoichi was away, the village fell on hard times and was taken over by a group of violent criminals. The blacksmith is now hard at work supplying all the hired thugs with their swords, and the stonemason is busy churning out grave markers. At the government coin mint, a crime boss and his more-respectable youngest son are stealing gold by debasing coins, taking a little gold out of each coin minted. Rumors abound that somewhere in town they've concealed a vast treasure, keeping it out of reach of the eldest son and his hoods, thugs, ruffians, etc. 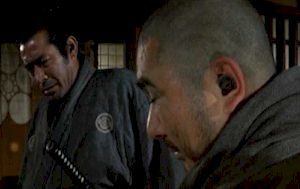 There's also a bounty on Zatoichi's head, a product of his earlier adventures, in which he cut down several high-ranking yakuza bosses, along with scores of their followers. The scheming eldest son of the crime boss has hired a samurai (Mifune), to add a little backbone to his army of mostly useless hoods. He is a skilled fighter, but his mercenary nature makes him more inclined to lie around in his bedroll sleeping off a perpetual hangover until a cowardly group of thugs tell him of the reward for Zatoichi's head. In a humorous scene, the staggering yojimbo attempts to capture the blind swordsman, but they have both had quite a lot to drink, and since this isn't a kung-fu film, inebriety doesn't do much to improve their fighting abilities. They utterly fail to operate their weapons, and instead settle on sharing a few drinks at the inn. As they become friends, tensions between rival factions hit a fever-pitch, and eventually, all hell breaks loose, leaving the two men on opposite sides of the conflict, and inevitably, crossing swords. In the action sequences, Katsu rises to the occasion, and he should, considering this is the 20th Zatoichi installment, and he has choreographed his own moves in each one. He draws his cane sword quickly, dispatches multiple opponents with subtle flicks of his wrist and a not-so-subtle stabbing motion, and before the last one hits the ground, he has sheathed his sword and is admonishing them for trying an under-handed sneak attack on a blind man. Fans of Japanese swordplay films should be used to this sort of fast-paced, brutal fighting, but those of you looking for more drawn-out, carefully choreographed, almost-balletic duels should probably look elsewhere. Notes:  Lead actor and producer Shintaro Katsu also produced the popular Lone Wolf & Cub series of films, and directed two Zatoichi titles.  Katsu faced yet another martial arts legend, Jimmy Wang Yu, in Zatoichi Meets The One-Armed Swordsman (1971).